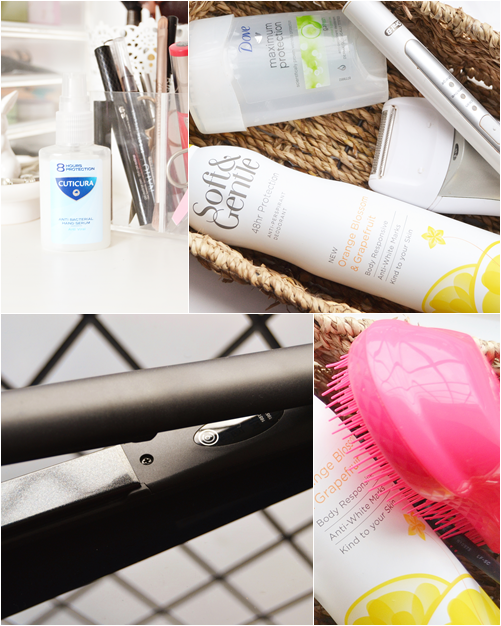 Today I thought I'd talk about products that I literally cannot live without and use on a constant basis. They may not be that exciting however they are my staples and I realised they never get mentioned! First up the most essential item of all; a toothbrush. Over the years I've had normal manual brushes and electric ones and whilst favouring electrics ones they always seem to break or I can't be bothered purchasing new brush heads. However finally with the Braun Oral B Slim Sonic one it's so good that I do re-purchase new brush heads and have had it over 2 years now. Before this brush I really did presume all electric toothbrushes were very similar but this is the first brush that rotates so much faster and feels incredibly light both in your hand and against the teeth... somehow like a fast micro vibration. There are probably lots of other electric toothbrushes out there that do this but I bought this at half price on Amazon at the time and won't ever be switching to a manual toothbrush ever again. Another essential is hair removal tools and this is a product I've got so much use out of. Initially I used this with the Epilator head which even though I didn't find too ouchy is a long and boring process.... also under arms is a no-go zone. So I decided to get more use out of it and swap the head for the shaver one. Now I use cheaper throw-away razors in the shower and use this as an inbetween shaver when I'm in a rush. The blades/rotating mesh give a close finish and can be used on all areas with different guards... also it had a handy light that shows up any areas you have missed. Also in the year I've had it I think I've charged it up only once! When it comes to deodorants I'm strangely quite fussy. I prefer aerosol sprays but nothing toxic smelling or that leaves a film that you can feel ,so my everyday one is the Soft & Gentle 48hr Protection Orange Blossom & Grapefruit Deodorant which gives enough protection throughout the day and smells and feel light - a perfect everyday essential. Then for ummm.... more sweater times i.e in summer, when I'm tidying/shopping/walking etc etc I opt for the Dove Maximum Protection Cucumber & Green Tea Deodorant (£4-5 in most supermarkets), this was a product I didn't think I'd like as it's a cream anti-perspirant however this soaks into the skin and works amazingly! The cost is a little extra than most other products but I highly recommend it if you are after full protection - it really does cut it. Maybe not as much of an essential but definitely a hair tool I use on a weekly basis and would say I couldn't be without. I've had many hair straighteners in the past and always been satisfied with them but the C9 Touch's just go beyond all the rest with it's many clever features. My favourite is that they only turn on and instantly heat up when in contact with your hair so you can plug them in and use them instantly. Also there are two heat setting with the lowest one working by simply clicking the plates together 3 times - the setting I most prefer. These also just glide through the hair making me able to straighten my whole head within 5 minutes. I love GHD's but I love these more! Still with hair I had to mention my Tangle Teezer and also the Beauty Bay Detangling Brush (£5 here) which I equally love. These kind of hair brushes are a god send for me and my knotty post shower hair. Before discovering the Tangle Teezer it would take me forever to gently tease out all the knots in my wet hair without losing too much of it in the brush! But now I simply spray my hair with a de-tangling spray and comb through with not much effort at all. This has been such a handy tool that I couldn't recommend enough if you have knotty hair. Other bare necessities include... Dead Sea Magik Black Mud Soap (SLS-free and perfect for sensitive skin - for body & face), Cuticura Hand Serum Sanitiser (kept on my desk and not at all drying to the hands), China Glaze Ridge Filler (this hides ridges in my nails and prevents then from becoming stained). 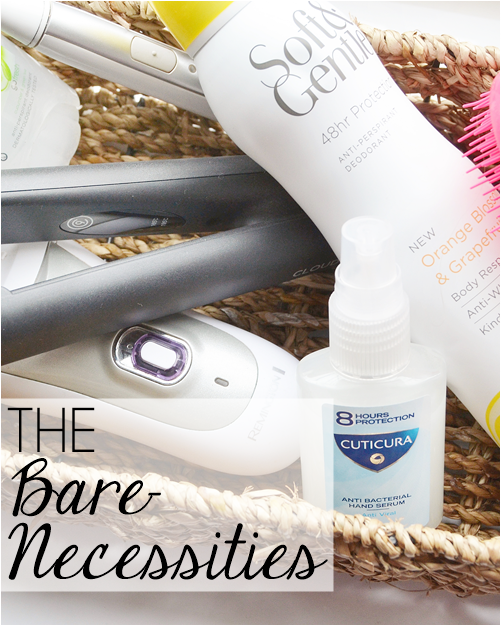 What are a few of your bare necessities?